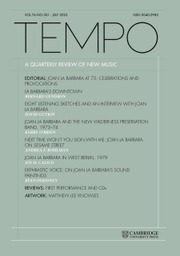 TEMPO exists to document the international new music scene while contributing to, and stimulating, current debates therein. Its emphasis is on musical developments in our own century, as well as on music that came to prominence in the later twentieth century that has not yet received the attention it deserves. The articles and reviews cover the new music scene in all its complexity, featuring discussions of compositional trends, performance practices, listening practices, new music contexts and reception histories. TEMPO is sympathetic both to writing about new forms of creative practice (electronic, interdisciplinary, performance-based) and to writing that employs innovative methods of enquiry that differ from the aims of traditional musicology.